Just a quick post to tell you that I have added some new things to my website! We normally only sell these boxes with Aurifil and Valdani at shows, but decided to put a few online so that everyone could have a chance to own them! These little 2" x 4" (approx) ruler boxes are perfect for so many things! This one has a spool of 50 wt. Aurifil thread in it. Each box will include a spool of neutral thread - I use grays and tans for almost all of my piecing. And if you haven't purchased Aurifil for awhile, I think you are going to find that it has taken a big jump in price. I've kept the price down on these - so get them while you can! And look at this eye candy! Valdani perle cotton is just so pretty! 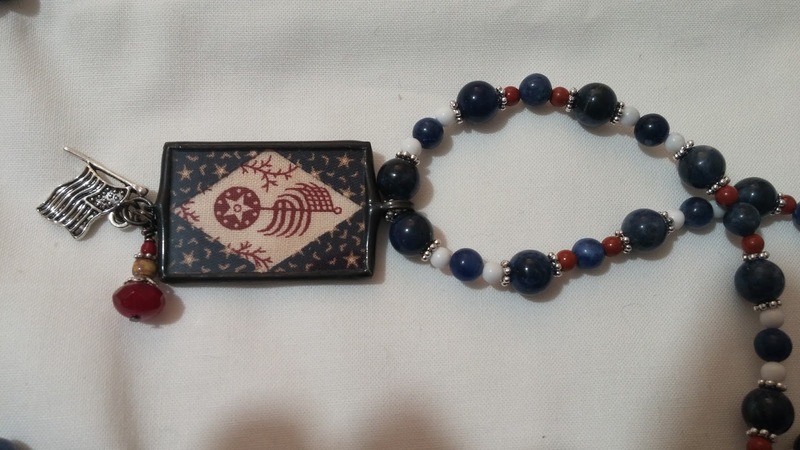 These will be perfect for all of your patriotic projects! I call these binding boxes, and they were first introduced in our Surprise program. They were a hit so we made more! My aunt makes all of the pin cushions. Cute! I have quite a few different colors, but usually only put them on the website one at a time. As I've said before, I only have 100 spaces on my site, and sometimes have a tough time deciding on what to include! If you want one and have a color preference, please e-mail me and I will see what I can do. Aunt Nancy is working on another batch of them, so we will have more in the future! These are all perfect gifts - get one for a friend, and you might need to get one for yourself too! Hope you have a great Sunday! The weather in Iowa is PERFECT today! Supposed to be mid 70's. I have the windows open and the birds are chirping! I'm always so behind on posts! I want to take you back to Quilt Market in St. Louis. I didn't take a lot of pictures, just a couple of some of my favorite people in their booths. This first pair are Emily and her hubby - from The Little Red Hen, in Muscatine, Iowa. Their amazing shop is only about an hour and a half away from me (I'm so lucky!) These two are so much fun - they just make me happy! And look at the yumminess behind them! Here is another corner of their booth - so inviting. They have beautiful wool and the shop is huge and filled with everything you could ever want! And of course, it's always great to see my friends, Missie & Jeff. This is Traditional Primitives from Missie Carpenter. Her booth is always packed full of all the gorgeous things that she makes. She loves hand work and will show you a demo of the technique that she uses for English Paper Piecing. Jeff has been known to take over the demo when Missie leaves the booth! Below are Jill and Vicki from Yellow Creek Quilt Designs. I met Vicki at the very first quilt show that I ever set up to vend at (that sentence feels very grammatically incorrect). I love them both and also love everything that they do. Jill designs fabric and I've made lots of jewelry from it. They also have designed some really great patterns and have a program called Kindred Spirits that is comprised of some wonderful little quilts. And look how cute these are! I bought a bunch of these at Market, and sold them all at the show in Kansas City. I think they are just adorable, and will definitely be getting more. If you are in my Surprise program, then you received one of these pendants. That's a lot of bling! This was the last Surprise box of the program, and I've got the next one almost completely planned. I bought a few things at Market that will be in one of the boxes. There are only 50 spots in this (that's about all I can handle! ), so it always fills up really fast. I will post more about it here on my blog, when I'm ready to start the sign ups. A deer ran right into the side of the van! I wasn't driving this time. Hubby was not happy about this at all! It's always something! Our strawberries are really yummy - so much better than what you buy at the store. I just wish that they lasted longer. I didn't intend to include this picture, but since it showed up, I'll leave it in! This is what I call our binding box. This was also in the Surprise program. One of our cute ruler boxes, and handmade (by Aunt Nancy) pin cushion and some Clover binding clips. Fun! 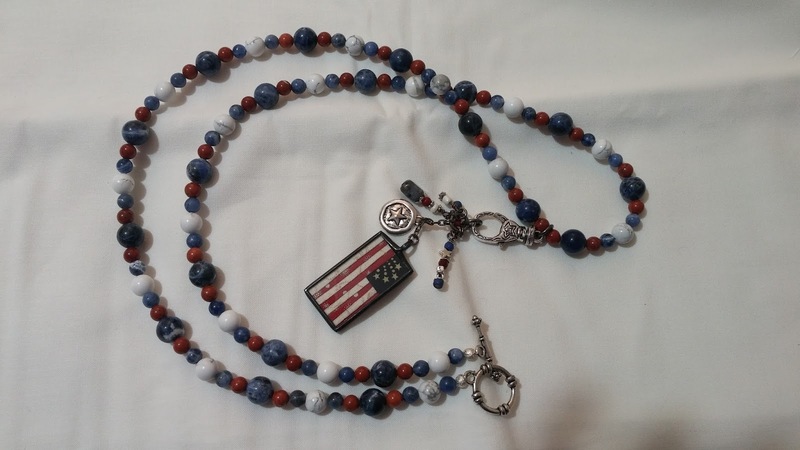 We have them on our website if you need to order one for yourself! And back on the home front - Callie hasn't changed any! Any time I open one of these doors, she thinks she needs to jump in there. And that's all for now! I had a great time at the Kansas City Regional Quilt Festival and will share some pictures of that soon! I always love to meet my online customers in person when I vend at shows. 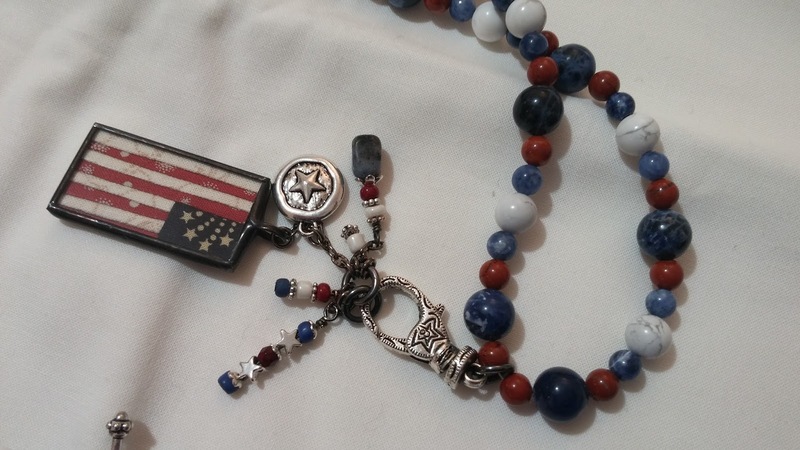 When we were in Dallas in March, I met one of those customers, her name is Betsy and she is so creative! 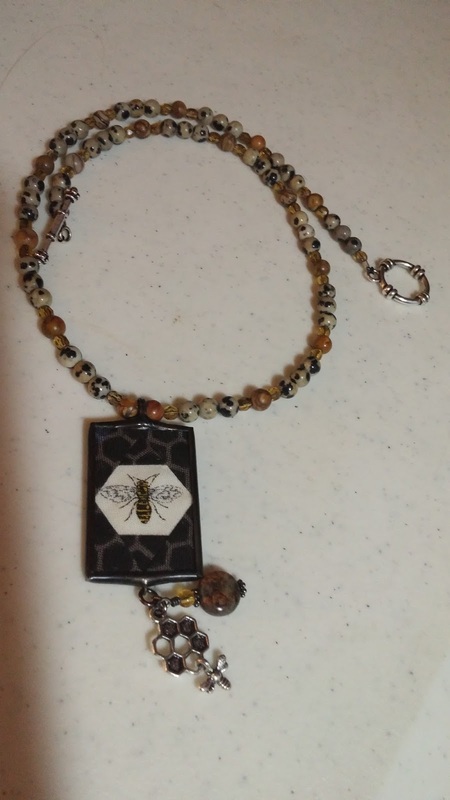 Look what she did with the bling bee pendant that she bought from me - love that beaded necklace! She recently ordered this blingy flag from me then took it to a retreat and made a beautiful beaded necklace to wear it on. Look at this! 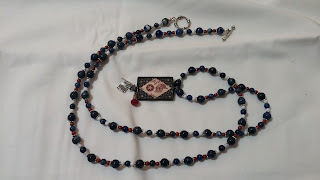 Betsy said that this one is about 32" long - so many pretty beads, I just love it! Thanks to Betsy for sending me these pictures!